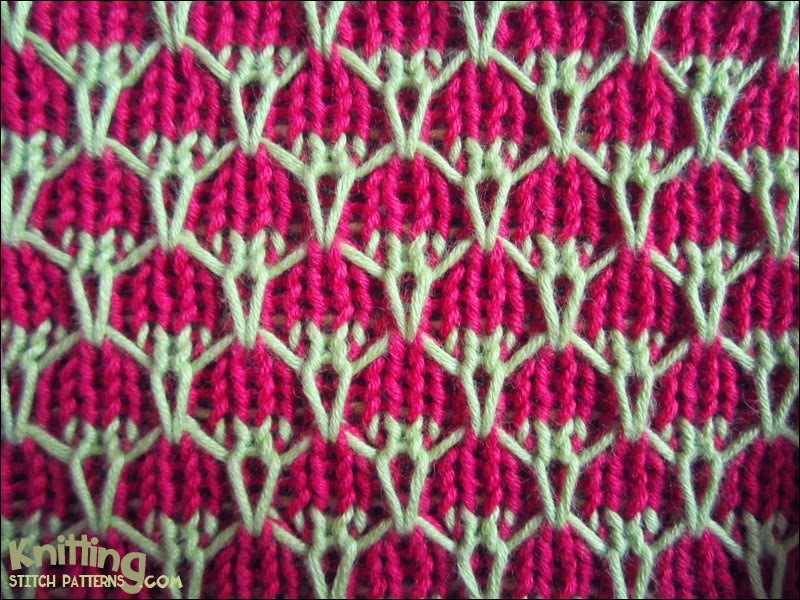 This stitch is knitted in a multiple of four stitches plus one and begins with a wrong side row. - Insert right needle under loose strand and then into next stitch knitwise, from front to back. Knit stitch normally then bring new stitch out from under the strand. Row 1 : With color A, purl all sts. Row 2 (Right side): With color A, knit all sts. Row 3: With color A, * p1, sl 3 wyib; repeat from * to last st, p1. Row 10: With color B, k2, * sl1 wyib, k3; repeat from * to last 3 sts, sl1 wyib, k2. Row 11: With color B, p2, * sl1 wyif, p3; repeat from * to last 3 sts, sl1 wyif, p2. Row 12: With color B, k2, * sl1 wyib, k3; repeat from * to last 3 sts, sl1 wyib, k2. Row 13: With color B, p2, * sl1 wyif, p3; repeat from * to last 3 sts, sl1 wyif, p2. Row 14: With color A, k2, * k2, k1 uls, k1; repeat from * to last 3 sts, k3. Repeat rows 3-14 until you have reached your desired length.